In 2016, the journey by train through Russia, from Moscow to Vladivostok and beyond to port station Nakhodka, takes about a week. But when the world’s longest train line, named the Trans-Siberian railway, was completed a century ago, it took almost four weeks at 20 miles per hour. The railway measures 5,772 miles (9,289km), crossing 10 time zones and two continents. As Google marks the 100th anniversary of its completion with a doodle on its homepage, here are five facts about the incredible infrastructural feat. First called “The Great Siberian Way”, the project was announced in 1891 by Tsar Alexander III. To secure funds, finance minister Count Sergei Wiite raised loans, increased taxes and printed rubles. Labourers had to work through extreme temperatures, and even had to fight off attacks by bandits and wild animals. The terrain was difficult, and the track had to circumvent swamps, mountains and forests, and workers had to blow up mountains to get round Lake Baikal. When the train first opened, passengers needed to board a ferry to cross Lake Baikal until a track around the lake was completed the next year, which included 33 tunnels and more than one hundred bridges and viaducts. The line had been built so quickly – 600 km of track was laid per year – and there was not time for the track to always be surveyed properly, so there were often delays when the trains started running. Convicts were transported to Siberia, where there was an acute shortage of laborers. The final stretches of the railway were constructed through Manchuria, on land leased from the Chinese, to bolster Russia’s imperial ambitions in the Far East. The railway was used to transport troops when the Russo-Japanese war broke out. 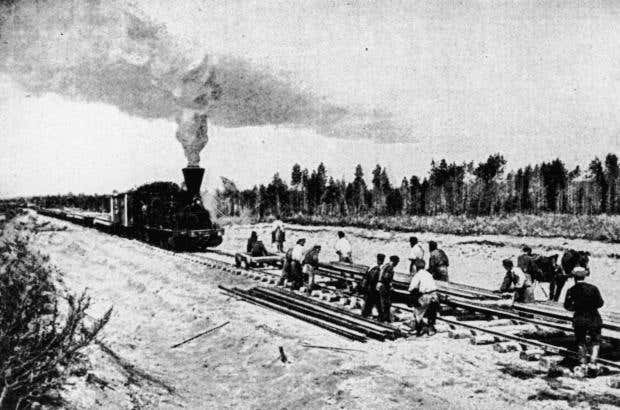 After the war, which ended in 1905, the Russians feared that the Japanese would take over Manchuria, and the railway was re-engineered to run entirely through Russian territory, along the Amur River. One of the bridges over the river, built in 1999, measures 2,612 meters. The original train had a library, a gym, marble tiled bathrooms, a grand piano and a first-class dining room which served caviar to well-heeled travelers. The luxury in first class was a stark contrast with the third class coaches, crammed with peasant workers and cargo. More than a century later, the train is still the only complete overland route through the entire country, with one compulsory overnight stay in Khabarovsk. Described as the backbone of Russia, it is still important for the country’s economy and national security.